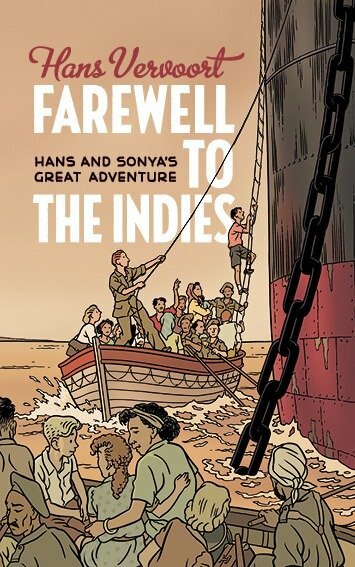 Theme: When the Japanese invade the Dutch East Indies during World War II, young Hans and Sonya (as well as their parents) end up in an internment camp for non-natives. They struggle through the next few years until the Japanese are defeated, only to find a new world where the Dutch colonial masters are no longer welcome, leading to a mass exodus back to the Netherlands. First up, I should note the obvious similarities in theme to John Sweeney's Elephant Moon, which was in fact the last book I read before this one. Both books involve colonialism in Asian countries that were invaded by the Japanese during the Second World War, and are told from the perspective of non-native characters who then have to cope with a situation where they no longer find themselves welcome, leading to a hasty exit through unusual means. Both involve children, though they are more prominent in this tale. Where the big difference lies in how the narrative unfolds, however, is that this is clearly a more personal work. Where John Sweeney relied on research into the past, Vervoort uses his own history. Hans Vervoort was born in the Dutch East Indies (now Indonesia) in 1939, and grew up there. Much of the setting and the events are built from his own memories, though one must qualify that he was younger than the fictional protagonists at the time of the war. In 1953, four years after the Dutch granted Indonesia its independence, Vervoort returned to the Netherlands himself, but spent much of his subsequent life missing his actual home back east. As such, the narrative here is very intimate, with little details thrown in here and there that make this feel like a very real work. The location and the period come through, with particular emphasis on local slang that help place the tale in that specific place at that specific time. It is possibly not as well crafted a novel as Sweeney's, but in so many ways feels more real. The tale is largely told from an endearing childlike perspective, which cuts across the clear horror and despair in a very intriguing way. As the narrator grows older in the camp and after, the joy and the sadness shine through in different ways as well, but at the end of the day this feels very much like an adventure book for young teenagers despite the horrors of war in the background. The characters are fairly well written, and the language is interesting. The plot moves forward at a relatively decent pace given the strained timeline, and as previously mentioned the narrative feels quite real for the reader. It's an enjoyable work, and a good look at what it must have been like for the author and other folks during those dark days. My only regret about this work, to be honest, is that I went and picked another colonial narrative right after Elephant Moon, and feel I could have done something a little more 'current.' That said, this is an enjoyable work that gives intriguing insights into that period. If you feel this could interest you, just go download it from the author's page (it's available for free!) and give it a read.